Junk makeover show. Jay Blades is in Walsall where he tries to upcycle a pair of tired dining chairs, a well-used table and some discarded DJ equipment. It's like waiting for the ships to come in, isn't it? How do you make money for nothing? Are you throwing this away as well? thrown out by us every year. This is nice, though, isn't it? on things before they hit the skip. so I know more than most about transformation. I revamp the old into the new and then sell it on for a profit. -They do need a little bit of fixing. -A little bit of love. You've done a brilliant job, mate. Brilliant job. people who had no idea there was cash to be made from their trash. Now, look at this. It's super busy. I don't know why I'm talking to you guys. I need to get out there and find some gems. ..that he can reclaim, revitalise and sell on for a profit. with a piece of furniture on its last bobbin legs. -Hello. Oh, let me give you a hand. -Hi, Jay. How are you doing? So, obviously, you're throwing this away. so we decided to get rid of all the stuff in the house. So you remember this as a child, then? 50 years ago, I guess, yeah. There's just only a certain amount of stuff we can keep, you see. -So mum doesn't mind you throwing it away? but good craftsmanship, in those days, by the looks of it. No, it was. And look, it's still solid. Obviously you've got that split in there, and that split. -But that's not a problem at all, actually. I do like it a lot. Would you mind if I was to take this? -And I'll keep you posted on what I've done with it. -It is that all right? -Yeah, that would be great. A jewel of a find indeed, Jay. So, David, any thoughts on what the future may hold for your mum's table? A bit of modern chic. What do they call it these days? Distressed chic or something? I don't know. I'm sure he'll do a good job. but here's hoping it won't be too distressed. Now, it's not every day you come across an oak table. Now, this table is lovely. and I think I know someone who can help me out on this one. ..Daniel Heath, the Renaissance man of rubbish. Daniel's passion is to take unused materials and make them sing. it into some visual that works. even thought of until they come along. ..and he's feeling pretty lucky today. I've just found a tub of money. That's a bit too easy, isn't it? All right, let's go and find some real items. Good idea. Perhaps David can deliver with his trunk full of junk. -How are we doing, mate? -Yeah. Not bad, not bad. Do you have the seats to go with them? I do. But these weigh an absolute tonne, these. They're soaked to the skin. Yeah, yeah, yeah. They've been in the garden for all summer, really. Well, let me have a look at those chairs. Yeah, yeah. Have a look at them. There used to be four but the other two broke. -The other two are broken? Yeah, I chucked them away a long time ago, yeah. What? You like the look of them, then, do you? I do like the look of them. You can tell that they've been outside because that's starting to lift. -That's just basically where the glue is. -Yeah, expanding. But they're still solid. -So that's... It's brilliant. The varnish has come off. -Well, that's a good sign, you couldn't break them. That's a really good sign. How long have you had these chairs, then? They haven't always been outside, have they? Oh, God, no, they were in the house for many years. Oh, I've had them 20, 30 years, something like that. In fact, these came with my second wife. She doesn't mind getting rid of these? -She helped me load them, actually. -She helped you load them? -It's all right to take these? I'll stay in contact with you and let you know what I've done. -Yeah, it'll be interesting, yeah. -Sorry about the wet hand. -That's all right. Not a problem. -I'll be back for those seats as well. -I'll get those out for you. But what do you think he'll do with them? I'd like to see them back and functioning, to be honest. I'd like to think somebody can sit on them in the future, yeah. So four would've been a lot better, but two is better than none at all. I think, in the right hands, these are going to look amazing. And Jay has four hands in mind that could be perfect. It can only be Katy and Richard. and they're sharing it with the world. Their passion is to take unused and unloved items and make them sing. than you. Would that be fair to say? And you can... You're good at reining me in. Our skills are sort of complementary, I think, as well. -We don't tread on each other's toes. It's very egalitarian, as long as he does what I tell him to do, I think. Well, someone will need to be for this challenge. tagged and loaded onto the Money For Nothing wagon. -I did it all by myself. -..and he's making himself useful along the way. -Shall we lift it high and dry? Could Lee's boot full of junk be music to Jay's ears? -No way. How are we doing, mate? Yeah, don't tell me you're throwing these away. -Yeah, I'm throwing these away. It's been in the shed for too long now, so I'm just going to get rid. These are nice, solid items, these are. Did you used to be a DJ or something? -About nine years ago, and I just stopped. What's in this one? Are you throwing that away as well? Yeah, I'm throwing that away. It's empty. -It's just a flight case. -So what used to be in there, then? Ah. So this is redundant? Cor blimey, they're heavy, aren't they? So what music did you used to play, then? A bit of funky house, a bit of garage, a bit of everything, really. -You must miss it, though, eh? -Why are they so heavy? Is it cos of the speaker that's inside it? Oh, there's a magnet in there? Oh, right. OK. So if it's all right with you, can I take them, yeah? It's going in there anyway, so yeah. cos these are too heavy, man. Blimey. A little less complaining, please, Jay. What do you think's in store for them, Lee? It'll be interesting to see what you can do with it. I can't see what you can do with it, but it'll be interesting. So these are so cool. What we've got is a massive long flight case and two industrial speakers. but I'm really excited about these ones. I think I can turn this into something amazing. That makes it three items banked. ..and Jay will work his magic on the old DJ kit. Now, that's it - done and dusted. Got three good items in the bag. which makes it the perfect spot for Daniel's workshop. Hopefully he's going to like it, even though it's falling apart. But it's a heavy lump, so I need him to give me a hand. -Let's get it in, on the bench. -Yeah. Let's have a proper look at it inside. -You could do something with this? Well, we managed to get it in here without it falling to pieces. Well, this side looks like it's going to fall apart at any time. -Yeah, that's all it is, really. And they're not split. They're good bits of wood. -..which will be quite nice, I think. That's a big shape, isn't it? Yeah, it's a nice surface area, for sure. But you've got to do the work. And then you've got to kind of fix it as well. I think I should probably think of them as two separate activities. -..and then add something to it. And there's lots of it, as well. Excellent. Daniel likes the table, but will Jay like the budget? -Then with a real signature print on the top. And do something special with the underneath as well. -..and you're going to make my job selling it easier. Stick it there, mate. I'm going to get in there quick. You know a good deal when you hear one. it's wonky and it's falling to pieces, basically. Now, Daniel seemed really pleased to take on that old, rickety table. Now, for £400, he's going to turn it into something amazing. I just can't wait to see the results. Daniel has agreed a budget of £400 to transform the table. Richard and Katy to lose themselves in the art of reclamation. and just needs a bit of love. but is now on its way down, and we can give it a lift, rejuvenate it. Forget about the chairs, I'll be right over. and I've brought them along these lovely teak chairs. Now, they need a bit of fixing. I'm sure they can handle that. -I've got something for you. -Do you want to grab one? -All right. Hey, Jay. How are you doing? -That one goes up there. -Yeah, very well. Good to see you. -And I thought they'd be right up your street, to tell the truth. -Yeah, just a little bit, then. Well, cosmetically they look a bit tired. -They are a bit tired. -which is a good start, isn't it? -Yeah, lots of potential there, I think. -It's a lovely shape, as well. I like this. This really interesting detail. and, yeah, spruce them up a bit. Obviously, I'm here, so it's your ideas, really. Strip them back first, I think. See what's going on underneath. bit more padded as well, make them super comfy. And this... This might be beech, I think. -No, this... I think this is teak. -I think we've got teak here, yeah. -So, that brings me down to budget. -How much are we talking? Well, I think we can probably do the pair for 150. -going to look a bit better than it is now. Yeah, we'll sand them down and put a little bit of treatment on the wood. -the colours of whatever material we use. -Are we talking your language? I LOVE a bit of colour. Not a lot. I love colour. -So 150, we've got a deal. -All right, enjoy. Have fun. -..and that's what we've got. But I'm really chuffed. There's a lot we can do with them. It'll be nice to get stuck in. Well, then, we won't hold you back any longer. and you know that's right up my street. I just can't wait to see what they do with them. Katy and Richard's transformation budget is £150. but perhaps they should be careful what they wish for. The creative hub that Jay calls home. but its partying days are well and truly over. because you've got compartments here, storage, storage, storage. On the back, there, we're just going to have one long mirror and some lights. Simple. Add the legs on, give it the height. I'm going to turn those into bedside cabinets. So you'll have a whole bedroom suite set. Too cool for school, Jay, or even the bedroom. uniformed colour, but really make a feature of these corners. and get all this dust and sand it a bit better. So that's both of them rubbed down, ready for the primer. So, the mirror part and also the dressing table. and what I mean is this, kind of, will be the lid. so you don't really want it to be on display. You know, all your messy stuff. lift up the lid and there you go. Good man. We like a bit of perfection around here. out is the big-boy saw to just save on the arms. body by wearing a dust mask and eye protection. cos this will be a perfect base for the actual lid on top. And it just makes it look a lot more neater. same colour as the inside. Then it should all go according to plan. But I have to admire your optimism. you can see the compartments working really well. Cor blimey, there's a lot to do, isn't there? You'd better get those sleeves rolled up. Over in east London, Daniel is about to get cracking on the oak table. do some really interesting things with it as well. First things first, the tabletop needs to come off so it can be repaired. out where I'm going to drill and put the dowels in. I'm going to use a wooden dowel. Wooden dowel pins are used to reinforce joints and support shelves. But first of all, I've got to mark where I'm actually going to put the dowels in. basically a guide for doing my dowels. both pieces of timber so that they'll marry together. Calibration confirmed, lashings of glue now required. I'm pleased with how it's come together. and they should, hopefully, end up with a really, really nice join. Daniel turns his attention to the legs. It's so nice to see a man happy in his work. So far, this table doesn't appear to be giving Daniel any problems. process that I'm going to do to it that's going to transform it. And I'm going to apply gold leaf to these sections here. ..apply the glue to the surface that will stick the gold leaf on. when the gold leaf is applied. Stick it all the way round. As you can see, it's a really time-consuming process. Time-consuming and fiddly, you say? Nothing like a little pressure to help get the job done. In south Wales, Richard and Katy have pulled up a couple of chairs. -What's on the agenda for today, guys? The first job, as ever, is to sand them down. them look really beautiful again. I'm going to take a look at the seats. because it may be that they're damp and a little bit old, bit smelly. then reupholster them and choose some nice fabric. -Yeah, bring them back to life. But it's quite a to-do list. I think it's going to shake a little bit once you sand it. make sure you always wear a protective mask when sanding. It'll put a smile on Katy's face. Yeah, I think Jay might be right. He thought it was teak under here. Yeah, it's looking like teak, isn't it? -It's not pale enough to be beech. It's lovely. The grain's really nice. So let's have a go at a leg. Confirmation of teak is good news. Teak furniture is amongst the most expensive, and why? It's sought-after for its elegance and its durability. just to pick out a few details. just to get an idea of what we're going to use. now is a good time to step inside a world of fabric. So this is my magic fabric basket. that might work for the chairs. So we're going to need something that's fairly hard-wearing, aren't we? -Oh, yeah, that's nice with the pink. You know what's quite nice about this? It's got a bit of humour to it. -The idea of sitting on a cactus. Yeah. Look at the colours in that! That's amazing. I love that fabric. It seems the guys are having far too much fun. Time for Minnie to jump in and help move things along. This one? What do you think? Say "Meow" if you like it. No. but the perfect fabric is in there somewhere. Time for Katy to focus on the seat pads. that we're not going to use, and see what's underneath. You can see straight away that it's suffered a bit of damp. It might be salvageable. Might sand it up a bit and just see. we might have to replace the wooden base as well. After a good start, it seems the chair is giving up some unwanted secrets. Perhaps converting these chairs on a small budget won't be so easy after all. Jay is putting the finishing touches to the flight case. its party days were well and truly over. turned this from a cast-off case into a dapper dressing table. Standing on a set of sleek legs, it comes complete with new compartments. and the dressing table can now play its part in many more nights to come. Now, this has come out exactly the way I wanted it to. We had a few troubles along the way, but that's to be expected. but I've got all the elements here. and let's put this down like that - the piece de la resistance. Check this out. It goes like that. Lee was clearing out the remnants of his old DJ career. Yeah, about nine years ago, and I just stopped. You must miss it, though, eh? imagination and the rhythm of his vision. ..a bold and unique dressing table. ensuring that it complies with all UK safety standards. Now Jay is back in Walsall to see Lee and show him the transformation. -Are you all right, yeah? -Are you all right, mate? your DJ set that you brought down? -So, how long had you had that for? -it's been in the shed for about four years. -Oh, has it? Four years! I think I've had it about eight, ten years. So, your DJ-ing days are over, then? As a matter of fact, I didn't do anything with them. But what I did with the deck was that. Turned it into a dressing table. -..and then you put all your storage in. -That looks good, that does. with the lights, you can change them, and it's LED. you think it's cool, but no-one's bought it. -No! No, no-one's bought it yet. I'm going to send some money your way. -You take care, my man. All right, mate. See you later. Now, Lee was impressed with the transformation. But we didn't sell it. Now, I'm a little bit gutted about that. Onwards and upwards - I'll get that sold. Jay spent £86.49 on materials. the profit will be making its way to Lee. polish in preparation for Jay's arrival. I hope he likes what I've done with it. Well, Daniel, we're about to find out. I'm here to pick up my broken drop-leaf table. Now, Daniel said to me he's going to give me something special. I'm just hoping he's done that, and he's put the table together again! it seemed this table's dining days were over. But now, it looks good enough to eat your dinner off! refresh and renew the old table. enhances the classy feel of this luxurious table. It's all back in one piece, but what will Jay make of it? You keep doing this to me! -Yeah, I'm good, I'm good. and you've got to give some of us a chance to catch up, mate! The legs are making a statement, but the top is something else. -There's lots of different things going on in this piece. and it's got so much movement to it. It's like a table in flight. Yeah, you've made a heavy table look superlight. And the legs, come on! these sorts of tables are quite commonplace. completely different from the rest of them? Jay's happy, but did all this quality add to the budget? than put it back together and paint it and give it a new look. No, don't say you haven't done anything. Look what you've done to that! That's a work of art, mate! You've done a bit more than just putting it together. the raw ingredients were there. -It just needed putting all back together and smartening up. But Jay is absolutely thrilled with the result. Daniel has opened up the true potential of that table. The oak table belonged to David, who was optimistic for its future. I don't know, I'm sure he'll do a good job. Now, Jay is on his way to see David to hand over the profit. -So, how have you been, then? -Yeah, not too bad, not too bad. So, do you remember the table you brought to a recycling centre? -..because she's moving down here with us to Somerset. and we couldn't keep everything. -So, you guys were there and took it away for us! to a guy called Daniel Heath. and do you want to have a butcher's what he done? -All right! Look at that! Oh, my word, that is amazing! So, all of that what's on there is his own design and he's printed it on. That is amazing. And I thought my dad had really bad taste in furniture! That's incredible! That is absolutely amazing. Wow! -So much so that it's been sold. because I want her to go away on holiday this Christmas. -She's going to love it. because the table was good. And it looks good and so much, someone's bought it. -So, it's going to keep full-circle. Thank you so much, that's just amazing. -Wow, brilliant. And tell Mum I said hello. And the money's going to his mum, so she can have a nice break. Daniel charged £400 to transform the table. ..leaving a £325 profit to go towards David's mum's holiday. There's something a little bit unusual about them. and I don't know whether Jay goes in for fairy tales, but we do! Well, guys, we're about to find out. and I want to know how they got on with those wet dining chairs. Hopefully they've dried them out and done them up a treat. Damp, damaged and about to be dumped. That was until Jay delivered them to Katy and Richard. It seems fairy tales do come true! refurbish and rejuvenate this pair of tired chairs. which meet all UK fire safety standards. But what will the boss think? How are we doing, gu...? Now, that's nice, isn't it? -Yeah, I do, I do like them. Yeah, it's unusual, isn't it? I've never used pink and brown together. -And I thought I'd done ALL of the colours! And you've got one up on me, actually. -So, why did you choose this fabric? -You know, not light, light, but golden. And then as soon as we got this, we thought, no, it's not going to work. and it had this teak colour in it almost. and try and colour match this. it all seems to work really well. It's got a rich kind of luxurious feel to it. Like a sort of '70s looks, feel. You've done it, well done. But has all that work added to the budget? Jay's been won over by the luxurious '70s look. I like that he was surprised as well. keep them guessing. And an unusual colour combination is a risk. -But I think it paid off. combination, but now I love it. Those chairs are pretty in pink. who would've been more than happy with a little spruce-up. but gaze at their beauty. said, "We'll have those, thank you very much!" Owner, Lorna, was delighted with her purchase. Really pleased. They're going to fit in well with the shop. Now, Jay is back in Walsall to hand over the profit. -How are we doing, are you all right? I'm good, I'm good, yeah, good to see you. -that you brought to us? -Oh, yeah, they were very damp, weren't they? Good grief. It's those chairs! and they've cleaned them up, and the seats, they've just got rid of them. New base, because the base was all wet. -..I was able to sell those. Well, you might have seen my prostate cancer badge. -Yeah. So, that'll go towards cancer. So, how far are you riding? Where are you going? of the Tour de France next year, so it's 195km. In one day, you're going to do that? -Cor blimey, well, you'd best get some practice in, then. I shall, yeah. Yeah, yeah, that's fantastic. -Thanks a lot, you take care. Now, that was a great result. and also the money is going to a great cause. Katy and Richard kept to their £150 budget. The chairs were sold for £265. Leaving David with £115 to put towards his charity event. Jay salvaged three items from the tip. Daniel wowed us with the oak table. Katy and Richard worked wonders on the dining chairs. And Jay produced some magic with the DJ kit. What a mix of tip finds. work, even the most tired items can be transformed. Jay Blades is at a Walsall recycling centre on a mission to save three unwanted items from the skip. 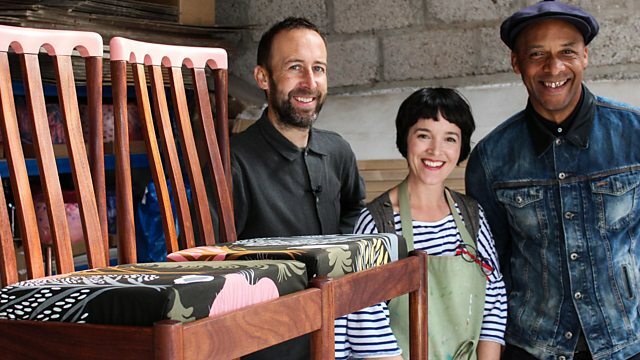 To help make his tip finds desirable again, Jay looks to upcycling duo Katy and Richard to lend a helping hand with a pair of tired dining chairs, while designer Daniel Heath gives a well-used table a fresh new look. Some discarded DJ equipment gets Jay's creativity flowing, but will he succeed in turning all three items from old to sold?